I was disappointed to find out Fox canceled Good guys. Im glad to have found it on netflix. There is hope. Netflix can pick this show up. Yes, I think it’s because smart people are tossing their television sets and so the good shows are not watched as much. One more reason to not pay for cable. The Good Guys is my favorite Netflix discovery…….and the music is awesome! I discovered it on Netflix to and I gotta say I’m really pissed off and mad about the fact that they cancelled it. Someone go down there to fox studios and raise some hell and chew their asses. I want to start a Kickstarter for season two. Let’s do it! Great show! So much fun! Bring it back really enjoyable and entertaining! My husband and I absolutely LOVE this show! Watching reruns on Netflix every so often, and so disappointed that it never continued. It has such a great chemistry and quirkiness that makes it enjoyable and laugh-out-loud entertaining to watch. Realy wish it could make a comeback. Apologies, BRADLEY WHITFORD! Misspelled that great actor’s name in first comment. 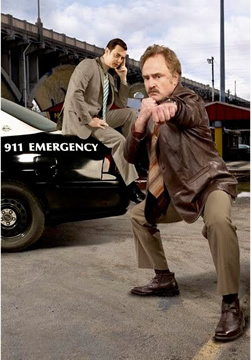 BRADLEY WHITFORD – BRAVO! BRING THIS SHOW BACK! Holy moly! Haven’t laughed so much with a truely good tv comedy show since Red Skelton. No canned laughter needed for this show. One laugh after another. Our family is very sorry that this show was cancelled. We found it hilarious, engaging, the performances and writing—tight. So sorry this was cancelled. Light hearted and fun! Wish they would bring to Netflix or something! I’am truly sorry this series ended, it gave some real enjoyment. regards. I’m very disappointed… This was a good show and it was funny. It seemed to run along a similar comedy line as the show Psych, but also had it’s own persona. In the days where remakes are popular, this show falls into its own quirky nitch. I really hope someone picks up the show on cable… Heck, I’ll take anyone picking it up for that matter.